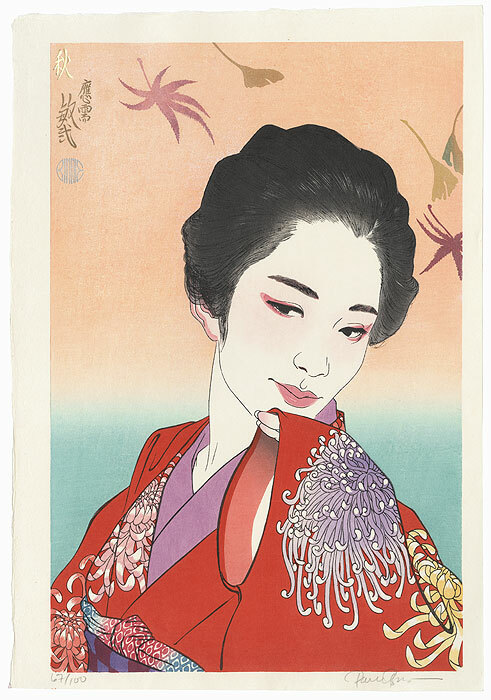 The Four Seasons (Shiki) - In 2003, a private collector commissioned Paul Binnie to produce a stunning series of four bijin-ga on the theme of the Four Seasons. These luxurious designs achieve an exceptional level of artistic and technical expertise, employing deluxe treatments such as mica, bokashi shading, and baren sujizuri (swirling baren marks). The first subject, Summer, was issued in a limited edition of 50, and due to its success, the commission was expanded to an edition of 100 for the three remaining seasons. Each print is pencil signed and numbered. Beautifully drawn and rendered with rich, sophisticated color, these gorgeous prints are a fantastic choice for a contemporary collector. Paul Binnie (born 1967) - Born in Scotland, Paul Binnie received his MA in Fine Art from Edinburgh University and Edinburgh College of Art in 1990 before working primarily as a painter in Paris. In 1993 he moved to Tokyo to study woodblock printing with master artist Seki Kenji. 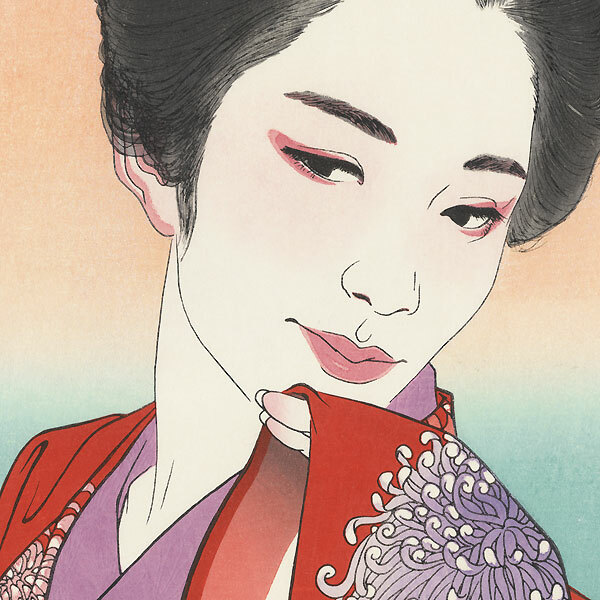 After nearly six years in Japan, he set up a studio in London, producing prints and paintings in a variety of genres, including landscapes, kabuki, tattoos, and bijin-ga (prints of beautiful women). He carves and prints his own designs, having developed an incredible mastery of these impressive technical skills over his years of experience. His lovely, colorful designs evoke a mood and atmosphere, following the rich tradition of shin-hanga woodblock printing yet, with his own modern style. 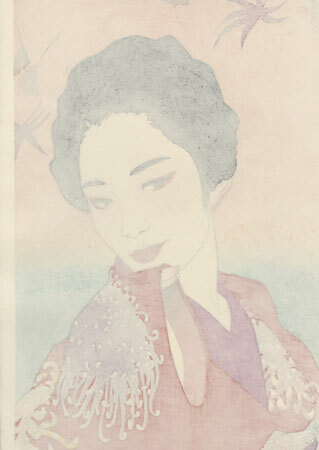 Today, he is one of the most highly regarded woodblock print artists of the 20th and 21st centuries. Condition - This print with excellent color and detail as shown. A few minor spots in margin. Pleases see photos for details. Otherwise excellent condition.